Once upon a time, the only lights that you’d see outside of a home were by the entryway, directly by the door. Well, those times have come and gone and we couldn’t be more excited about it! Today, there are a number of ways that you can incorporate outdoor lighting to the exterior of your home. The team at Lighting Concepts has found a variety of ways to incorporate exterior lighting to countless Trussville homes. In today’s blog, we’re going to touch on three of the main ways that we have incorporated exterior lighting on homes so that you can get those creative juices flowing. Lighting has always been a great way to focus on safety outside of the home. While the light by your front door may make it easy for you to identify anyone at the door, that’s not exactly the safety we’re talking about. Lighting has been used to show pathways, stairs, and entrances outside of a home. This is a great way to direct people while also avoiding slips, falls and tumbles along the way. Okay, now we are talking about that kind of safety. Lighting is not only great for safety features, but it’s also great for security. There are quite a few types of lighting features that are designed to let you know when someone is outside. These motion sensor lights are a fantastic option when looking at exterior lighting. Not only do they light up when there’s motion outside of your door, but any guests that you have stopping by the house when it’s on the darker side won’t have to sit in the dark. That’s what we like to call a win-win! Yards require money and time, and what good is that if you’re not able to showcase it? 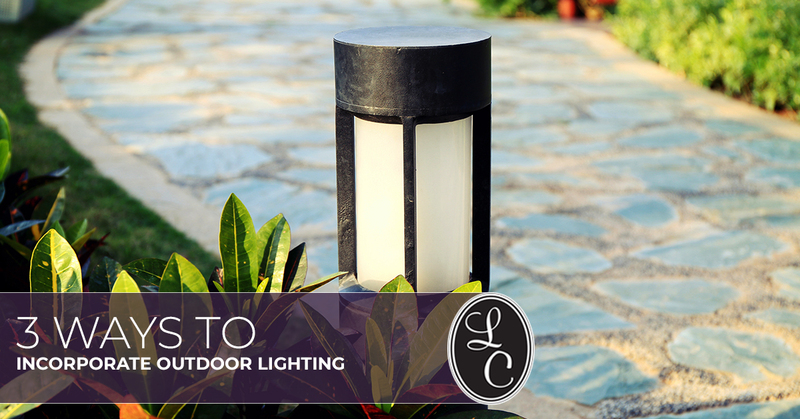 If there’s a part of your yard that you’re proud of, consider adding exterior lighting for these features. With this type of lighting added to your home, you will be able to enjoy the beauties of your yard when the suns out, and when it’s not. Make the most of the time and money you’re investing by showcasing it all times. Aside from being able to brag about your yard a little more, you’ll also add some extra design points by adding these lighting features to your yard. Yes, that means your yard just got a little bit better looking! Today we covered three of the ways that you can incorporate exterior lighting to your home, but they’re far from the only ways. In fact, each of the ways that we talked about above offers at least three different lighting options to take advantage of. If you’re truly interested in adding some exterior lighting to your home, visit our lighting showroom in Trussville. A member of our team will be able to spend time hearing your goals and can direct you to the lighting options that will yield the best results. Interested in stopping in? Reach out to us! A representative will let you know the current state of our showroom and could even schedule an appointment for you to meet with a team member. If you have an idea of what you’re interested in, feel free to browse our catalog of lighting products.